We Want to See You at Field Service USA! It’s that time of the year again as we get closer to one of the biggest field service events of the year, and we want to see you there! What better place, or way, to meet the best service organizations spanning a multitude of industries. 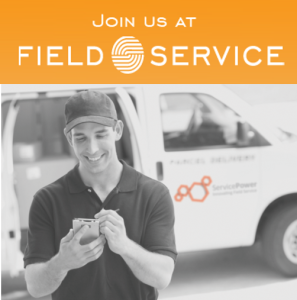 In the past year, ServicePower has gone through a lot of changes, and we want to take the opportunity to talk to you about them at Field Service. I joined ServicePower as their CEO in July of 2013 and we have been working to transform the future of field service through the likes of M2M technology that directly integrates with our ServiceScheduling, as well as an innovative mobility solution that offers a unique mobile platform build specifically for field service management. So let’s engage. We want the opportunity to tell you more about how we are growing as a company, and what we can do to help your company grow as well. It is our mission to develop strong, lifelong partnerships with our clients, to support them with their field service challenges, ensuring they get the best ROI from our products, as well as a competitive edge. Come have a beer with our service experts on Monday, April 21 at the Beers and Bocce Ball event. Visit our booth (Booth 26) to see a demo and enter to win an iPad mini. And make sure to catch our VP of Alliances and Strategic Partnerships presenting the Innovation Spotlight on Thursday, April 24th, at 10 a.m. Looking to engage with ServicePower, either as a partner or a client? Request a meeting with us while you are at Field Service. We look forward to speaking with you, and showing you what a future with ServicePower means. See you in sunny California in just a few weeks! Moving at the Speed of the IoT: Can your scheduling system keep up?